[prMac.com] Tapfheim, Germany - MW3D-Solutions today is thrilled to announce Cheetah3D 7.1, an update to its popular, professional level 3D modeling solution for macOS. Developed from the ground up utilizing the latest Cocoa technologies, Cheetah3D is a lean, fast, and elegant 3D modeling, rendering, and animation package with an easy learning curve. After a smooth rollout of Cheetah3D 7.0 two months ago many powerful new features like polygon reduction, a loft modelling object and a vastly improved text spline object been added. Users with limited amounts of RAM will be happy to hear that the renderer is using considerably less memory with Cheetah3D 7.1 which allows even more complex and realistic scenes. 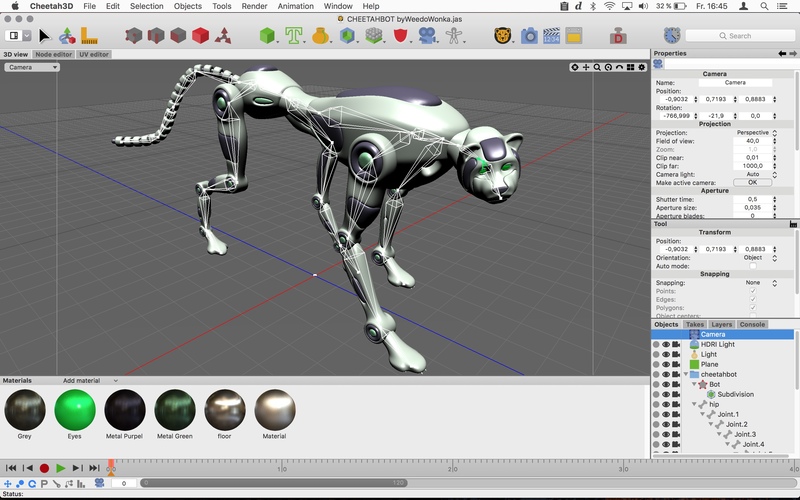 Cheetah3D 7.0 is priced at $99.00 (USD) for a single-user license. Customers may upgrade from older version for $59.00 (USD). For customers who purchased Cheetah3D 6.x after April 1st 2015, the Upgrade to v7 is free. Located in Tapfheim, Germany, MW3D-Solutions is an independent software developer whose main goal is the development of easy-to-use yet powerful 3D software exclusively for Mac OS X with a focus on iterating state-of-the-art 3D modeling, rendering and animation algorithms into a true Mac user experience. Copyright (C) 2004-2017 MW3D-Solutions and Cheetah3D. All Rights Reserved. Apple, the Apple logo, and OS X are registered trademarks of Apple Computer in the U.S. and/or other countries.